By Peter Anderson 17 Comments - The content of this website often contains affiliate links and I may be compensated if you buy through those links (at no cost to you!). Learn more about how we make money. Last edited February 1, 2019 . 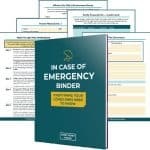 Today is day two in “In Event Of An Emergency” week here at Bible Money Matters. The posts this week are looking at ways you can plan ahead for unforseen emergencies, tragedies or hard times. Yesterday we looked at how you can make sure that all your important documents are safe by having a fire safe in your home, and a safe deposit box at the bank. Today I thought I'd take a look at something that's important for your family to have in the event of your untimely passing or disabling injury. It's what I like to call the “What To Do If I Die” spreadsheet or database. The idea has been written about before by many others in the personal finance community, but it can't hurt to do it again. It is THAT important. So what is it exactly? The “What To Do If I Die” spreadsheet is a place where you put together all of your important personal and financial information in one place, where your loved ones can access it in the event that you're not around to help them. Here's one that I put together and that you're free to use. Let's dive in and take a deeper look. What Type Of Information Should I Put In My Spreadsheet? Where Should I Keep These Documents? The type of information that you put in your database is really up to you, but for me the things I decided to include were things that I thought my wife might have a hard time finding otherwise, or that would be a pain to track down. You can include as much or as little information you're comfortable with including – for example if you don't want to include passwords in case someone gets a hold of your spreadsheet, just keep your passwords separate in a program like http://keepass.info/. KeePass will allow you to save all your account usernames and passwords, and password protect them under one master key. A good idea for security. Bank Accounts: Add all information regarding your regular checking and savings, in addition to any online savings accounts, money market accounts or CDs. Include things like website addresses, usernames, passwords, account numbers and contact information for the bank. Investment Accounts: Put down all information about your 401k, IRA, Roth IRA and other investment accounts that your family may need. Include things like website addresses, usernames, passwords and contact information for the investment acccounts. Mortgage Account Information: Include all information about your current mortgage, including amount owed, amount due, website addresses, usernames, passwords and contact information for your loan servicer. Insurance Information: Include all your information about any life insurance, disability insurance and other insurance that you have purchased. Include website addresses, usernames/passwords and contact information for the insurance company. Credit Card Accounts: Include information about any credit card accounts you may hold including website addresses, usernames/passwords and contact info for the credit card company. Other Liabilities/Loans: Include other liability information including student loans, auto loans or home equity lines of credit. Once again include any website addresses, usernames/passwords, account numbers and contact information. Side income: Make sure any side income or assets that the family might not know about are listed here. In my case I could list this blog which would continue to collect income if I die. It could also be sold as an asset. Also be sure to include usernames/passwords for all accounts related to that side income. It can be a good idea to keep a list of monthly expenses that need to be paid in case you aren't around to pay them. It will make things easier for the person trying to cope with your loss. In doing the list of expenses you may even want to do a complete budget (if you haven't already) and have a family budget meeting to talk about your finances. If you do that on a regular basis it will make this process that much easier. While it may not be fun to think about you may want to write out instructions for how your significant other can collect life insurance, disability or other benefits. Write out who they need to contact, what they will need to do, and how they will need to do it. This can take a lot of stress out of the situation. Once you've put together your worksheet of information, it's a good idea to figure out where to put it. For me I'll be putting the information in a couple of different places. First, it will be kept on my hard drive of my computer in the “My Documents” folder. Second, I'll put it on a USB flash drive and store it in our fire safe. Keep a copy in your safe deposit box if you have one. Third, I'll email myself a copy zipped and password protected to my gmail account. I'll then label it “If I Die”. Once I've set up all these copies of the document(s) I'll sit down with my wife and make sure she knows where to find this information in case she needs to. Update: Reader Nathan suggested the following alternate method for saving your important documents. Get a USB flash drive on which you install a password manager like KeePass to securely manage usernames and passwords. Install an encrypted drive on the same USB flash drive using something like VeraCrypt. Keep all your important documents there. Update your data as needed, and have a software like SyncToy backup all the data to your computer from the USB thumb drive. Use a backup service like Carbonite, OneDrive or DropBox and upload your encrypted files on occasion. That way you know your data is backed up off site in case of disaster. Keep the passwords for KeePass and VeraCrypt in the fire safe for safe keeping in case you die. 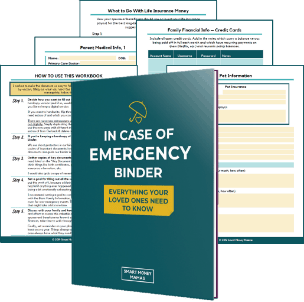 If you'd like something a little bit more comprehensive than our “What if I Die” spreadsheet above, our friend Chelsea over at SmartMoneyMamas.com has put together what she's calling an In Case Of Emergency Binder. Have you set up something like the “What If I Die” spreadsheet at your house? Does having it give you peace of mind? What other things do you think should be included in the spreadsheet? What method do you use to backup important files? Tell us about it in the comments! Thanks for this great information. I have been married now for 3 years, and have never had a good place to store all of our valuable information. Before today I didn’t even know what I should store and what I could leave out. But it’s always been on my mind that I needed to get prepared. I just didn’t know where to start. Thanks for helping me get started. I keep meaning to do this. It would take Mark MONTHS to sort out our finances/passwords/accounts if something happened to me. Hrm.. guess it goes on the elephant list. I’ve done almost exactly what you are suggesting with the spreadsheet and all…I love the idea of having it all backed up on a disk and usb, that way I’m covered 3 times as good. This is important data, and I want my family to have it easily accessable WORST CASE. We really need to do this. We have some spreadsheet that show US our financial situation, but would be hard to locate and interpret by family members in the event of an emergency! This is a fantastic idea…. Dave Ramsey talks about this and calls it a Love Drawer. I’ve created something very similar with all the important Insurance and Bank Account information. I even included a letter to my wife to confirm thoughts and ideas that we don’t always stop to convey. The idea is that it can include so much more than just the mechanics of account numbers but even compiling and clearly communicated the basics will be shout “I love you” if/when the contents are ever required. Great idea that can’t be communicated enough! T. Rowe Price has a free software program called the “Family Records Organizer” that does all of this (except the password and username items). It’s really easy to use and it prints out a nice itemized report (or you can save it as a PDF). I wrote about another aspect of this at http://www.tinyurl.com/joedeath and article titled “on my death, please take a breath.” I talked about how those who inherit money can make some really bad mistakes on day one, and get a huge tax bill. JoeTaxpayers last blog post..Credit Card Rate Caps coming? Great suggestions. I have a spreadsheet that I use to track our finances, and I have a tab called I.C.E. (in case of emergency) that has all of our accounts, their information, stuff about insurance, so that if something happened to me, my wife would be able to make sense of our money situation and know where to look. that’s the one! it is linked in the article above as well! I’m printing this off. Excellent info. I need to do this! btw, I subscribed to your feed. Thanks for sharing the great content, Peter. Thanks for your kind comments, and for subscribing! That’s a great idea. We have a detailed budget, but things like account numbers and passwords aren’t really included with that. We do have tabs with our amortization schedule and notes on how much we still owe at the bottom of the budget each month. Now we just need a fire safe. thefinancefiends last blog post..Will a Garden save money? Did you give a sample of the spreadsheet you talk about? i missed any link to it and if you didn’t i will stop looking on the page. thanks. Previous Post: What Should I Put In My Safe Deposit Box Or Fire Safe? Next Post: What Types Of Insurance Should I Have?